Live CDs are self-contained operating systems on a single bootable CD, DVD, or USB device. They're handy when your machine runs into trouble. In one of your answers, you recommended booting from a live CD. I have no idea what that means. Explain, please. Live CDs (or DVDs) are exceptionally convenient to have around as diagnostic aids when you're experiencing a problem with your computer. I'll describe what I mean by Live CD and I'll show you a couple of examples. A Live CD or DVD (I'll use CD throughout, but this applies equally to either form as well as bootable USB devices, in some cases) is a CD from which you can boot your computer and have it work, without requiring other software to be pre-installed on the machine and without modifying the machine's hard disks. In fact, you don't need a hard disk at all, in most cases. The idea here is simply that the Live CD is completely self-contained. You can boot from it and run whatever operating system is contained thereon, all without making any changes to your computer and requiring anything but the basic hardware support from your computer: keyboard, display, mouse, and frequently network. My most common recommendation is typically Ubuntu Linux. 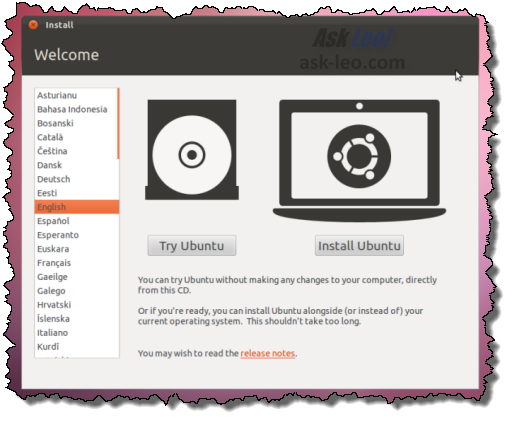 If you make sure to select Try, then Ubuntu behaves as a Live CD. Once booted, you can access the internet, run FireFox, and perform a host of other tasks - all without having had to install anything, anywhere. 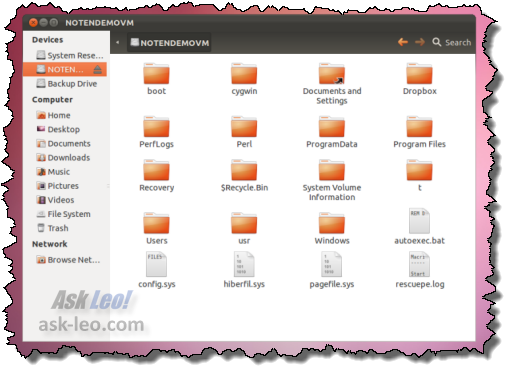 For diagnostic purposes, Ubuntu includes a standard set of common utilities that can be used to access, and in some cases, repair your computer. Knoppix has been around for a long time. It's another Linux variant that is designed specifically to be a Live CD. Boot into Knoppix from CD and you're running a fully functional machine without touching your hard disk. As you can see in the example screen shot above, Knoppix comes complete with LibreOffice among many other useful productivity and diagnostic tools. SystemRescueCD, as its name implies, is a Live CD specifically aimed at diagnosing and repairing system issues. SystemRescueCD contains a long list of tools, ranging from the simple to the geeky that can be used to repair an ailing system. What's a Live CD good for? The single most common use of a Live CD is to recover files from a damaged hard disk. Why are they all Linux? In short, because Microsoft Windows costs money. Unfortunately, the licensing terms under which Windows is provided prevents the distributions of Live CDs built using Windows. The one solution is to build your own Live CD using a tool like BartPE, which takes your existing legal Windows installation and from it, builds a bootable CD. It's an extra step and it's not always necessary. Hence, the focus on Linux-based Live CDs which are readily available and ready to go. Even though it's not required and it's not modified by running the Live CD, the system hard disk is typically accessible once you're running the Live CD. Pictured above is the hard disk of a Windows 7 machine, viewed through Ubuntu Linux's version of Windows Explorer. Using that, you can navigate the hard drive and copy files to an external hard drive, another machine on your local network, or perhaps even upload them to the internet. If the hard disk is working but your machine won't boot for some reason, it's a great last resort for recovering files before you reformat and reinstall. I'd say that the next most common use of a Live CD is to help determine if a problem is hardware or software related. By booting up your system from a Live CD, you can quickly tell if the keyboard, mouse, monitor, CD drive, and the hard drive are all working properly. If they are, then that might be important data in determining the root cause of a software-related problem that you're experiencing. Also important is the ability to modify the contents of the hard disk. It's not uncommon for technicians and other repair or recovery personnel to boot from a Live CD and then actually go into the Windows files on the hard disk to make a repair of some sort. About the only real drawback of most of the Live CDs is that they do tend to be rather geeky at times for most operations beyond simply examining your hard disk and copying files. I've only touched on three examples of Live CDs. In fact, there are many, many more. In researching, I found this list of perhaps 100 different Live CDs. Regardless of which you choose, I actually recommend downloading one - perhaps one of the ones listed here - and trying it out to get just a feel of what a Live CD looks like running on your machine. You never know - someday, it might just come in handy. How do I run an anti-virus scan if I can't boot? It's hard to run an anti-virus scan if you can't boot from the hard drive. To run an anti-virus or other scan, you'll need to take some special steps to boot from something else. What's the best way to bank online using a dedicated machine? Using a dedicated machine is one approach to significantly improving the security of online operations. I'll examine the approach and alternatives. Please keep in mind that old saying "There are no stupid questions..." Is it possible to use the Linux software on a computer that uses Windows? Yes, it is possible to boot a Windows computer with Linux. The part of this article talking about Ubuntu is describing how to do just that. Hi Leo, this may be another "stupid" question...What is the difference between a recovery disk and a "live" CD? Are they one in the same or should I have both? Another great use for LiveCDs (or their USB thumb drive counterparts) is for use at WiFi hotspots. It should protect the computer from viruses. As long as the user refrains from risky Internet activity (which is more of a risk to online accounts), the laptop should be rather well protected. For this purpose, Ubuntu and Knoppix work well; but I prefer Linux Mint as a ready to go OS. "A recovery disk contains the tools and additional information that can be used to "recover" your system using information stored on your hard drive. That "information" could be the I386 folder, it could be a hidden recovery partition, or it could be something else entirely. The key is that the recovery disk uses a bunch of information on your hard drive." 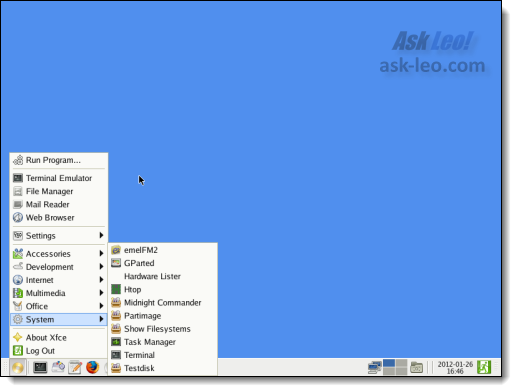 from the Ask Leo Article: What's the difference between a recovery disk and an installation disk? A live CD is a CD with a bootable OS as described in this article. In sidebox you state that you don't have windows live CD because they cost money. I don't understand. Can I download a Linux (ubuntu) live CD from the internet for "free" or do I have to go buy a physical CD and put it in my laptop. I end up having to buy a CD don't I? The Live CDs I discuss in this article all run Linux. You can indeed download Ubuntu for this purpose. But they are not Windows, that's why they're free. To create a Live CD that actually runs Windows you need to create it yourself from your legally paid-for copy of Windows. Not worth the effort in my opinion. 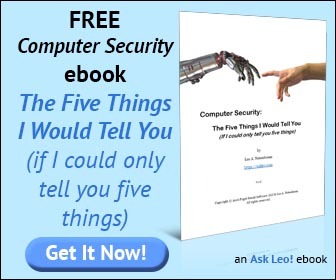 In the sidebox, Leo doesn't say that he doesn't have a Windows Live CD, he says that Windows doesn't provide a Live CD. It is possible to create a Windows Live CD yourself. First of all @Jacqi, yes. It's only Mac OSX that doesn't run on a standard PC (that hasn't got an intel processor), Linux and Windows are basically written in the same programming languages (not quite but basic enough for purposes of the answer), and support the same hardware! If you wanted, and I'm not sure if this was what you are getting at, you can actually install a flavour of Linux along side Windows and configure a dual boot - which is easy enough to do if you know how, but could get a bit advanced for this comment. Also, the main point I wanted to stress was the fact that I think people should also consider creating a Live USB/Flash Drive as well, or even rather than a CD/DVD. There are many tools to make your USB drive bootable available online and modern BIOSes should support booting from a USB device (I don't know how modern they have to be off hand). I do find CDs are more hassle than they are worth, especially nowadays, for one point. However, the main advantage is that they are rewritable so you can save data configuring your Live media, etc. and it prevents you from having to burn a new CD every time an update is released etc.! Plus, once the content is loaded, it will be much faster than if it were on a CD. I think the same also applies for installation media - instead of burning your image file, just extract the content onto a bootable USB drive. Though, that's just my humble opinion and I can understand and respect anyone who disagrees or differently opinionated. Be very careful if you make a "live" cd from the BartPE system, that you NEVER use it on a W7 machine. It will corrupt the boot process. BartPE was designed for the older flavors of Windows through XP. Leo, I tried to follow the instructions and made some very detailed notes to supplement my poor memory. I *think* I did it correctly, but when I restart my machine with the CD in, the CD is completely ignored. Maybe a bit more explanation would be helpful? Here are my "notes to self"
http://www.ubuntu.com/ and click "Get Ubuntu now" and on the next page, "Try it from a CD or USB stick"
"Step 1: Download Ubuntu" I changed it to "64-bit" and downloaded "Ubuntu 11.10 - Latest version"
This downloaded a 697Mb iso file to my desktop. I put a CD-RW (650Mb) into the disc drive. "Step 2: Burn your CD or create a bootable USB stick"
and there I indicated I wanted a CD using Windows and there clicked "Show me how"
1. Right-click on an ISO image and choose 'Open with > Windows Disc Image Burner'. The disc ejected with the note "The disc image file is too large and will not fit on the recordable disc." So, I put in a DVD instead and tried again. After the disc was done, I got "The disc image has been successfully burned to the disc." and it ejected. Simply closing the disc drive at this point did, as expected, nothing. no option to go into Linux. The BIOS in your computer needs to be configured to check for a bootable CD before the hard disk. How that's done depends on your BIOS I'm afraid. Ken Laninga - I'd suggest you need to select the correct boot device. You need to tell your computer to boot from the optical drive. Insert the disc into your optical drive, then restart the coputer. Watch the monitor closely when the computer boots. It should (briefly) display text giving you some clues. For instance, I'm running a Toshiba laptop. On boot up, I have the option to enter the BIOS by pressing the F2 key on your keyboard, or selecting the boot source by pressing the F12 key on your keyboard. The exact combination can vary depending on the manufacturer, and you'll find the best way to select your preferred option is to continually tap the prefrred Function key until presented with the appropriate option. You can select the 'Boot sequence' in the BIOS. This tells your computer to look for an operating system in specific places. You can opt to boot from the optical drive as your first preference. In this scenario, if the computer does not find a bootable disc in the drive, it moves on to the next preference, usually the hard drive. Be warned, making changes in the BIOS can cause serious problems if you select the incorrect options. Be sure you are aware of the risks. 2. How do I make a USB boot on my machine? I don't have a USB booting option. 1. If you download a iso file your burning program would have an option to burn that as a disc image. I can't give more details as I don't know which CD/DVD burning program you have. 2. If you don't have that option on your computer, it means you'll have to rely on the CD/DVD method. You also have to make sure the boot sequence in your BIOS settings are set to boot first from CD/DVD. It appears that BartPE (for Windows) doesn't do anything beyond XP. So, what about Win 7? It would be nice if your staff did a bit more research so that we didn't have to do it for them. My research staff is me. Leo. That's it. I'm not aware of a Win7 Live CD solution. I tried the Ubuntu one and got as far as "try ubuntu" - lots of dvd whirring later I get a weird coloured screen and nothing happens. Also tried SystemRescueCD and it appears to work, but how do I find my hard drive files? As for the Knoppix version, I don't know which of the many ISO files on the ftp site to download. Tried one but my laptop won't boot from it. So - all in all, this task is not as easy as you make it sound! Prior to a reinstall of XP, I tried Linux "Puppy" from a live DVD [downloaded from an Aussie website]. Not only did it provide an OS platform, but also allowed saving to the same DVD - cool, eh? It's as if the DVD acts like a HDD. I'm glad I tried it. Then I proceeded to reinstall XP. What operating system does the "Windows Stand Alone System Sweeper" use? It boots off a USB flash drive or CD, and does not use anything from the hard drive. It has its own live OS built in. I downloaded unbuntu-12.04.1-desktop-1386.iso and burned it to a DVD. My computer will not boot from this file; it is simply a file to install Unbuntu as my OS. I've set the bios to have this file as 2nd boot and restarted Win 7 but it will not boot from this D: drive. What am I missing, Leo? Thank you. If you still see the ISO as a file on the DVD then you haven't burned it correctly. A special technique must be used to turn the ISO into bootable media. Would you show me how to burn ISO files? Make sure that your computer is also configured to boot from the CD/DVD drive. How do I boot from CD/DVD?